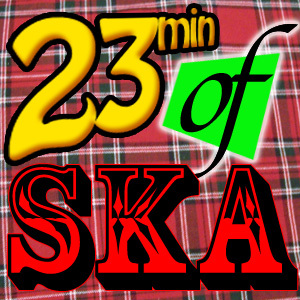 Here we go with another awesome episode of 23min of Ska. There is some pretty fresh tracks on this one! Green Room Rockers cover of “Wagon Wheel” from their Ska is Dead II 7″, as well as “They Say” from the reunited Inspecter 7! Not to mention the final song here from Johnny Cakes & the Four Horsemen of the Apocalpso, I don’t think that album has even come out yet! The rest of these songs are from bands I’ve just recently got into, the whole album from the Pandemics is great and I don’t know how I’ve been missing the Amalgamated for the last few years. Finally for the first time I’m playing some bands with ska puns in their names… but the Good Skamaritans and Abraskadabra were just too good to pass over!